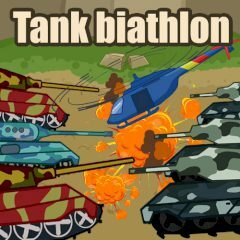 Direct your tank squadron and destroy all hostile tanks on your way. Click fast on the crosshair to help your squadron with additional attacks. When you receive enough money, spend them on upgrading the tanks! There is nothing impossible for the tank squadron like yours, because all tanks act like one! Lead them through this hell and survive all ten waves to complete the area. Upgrade your tanks after each combat and spend money on improving their health, regeneration and attacks. Add tanks to your squadron when you have funds for it!